Are all the Hello Kitty's fan ready? 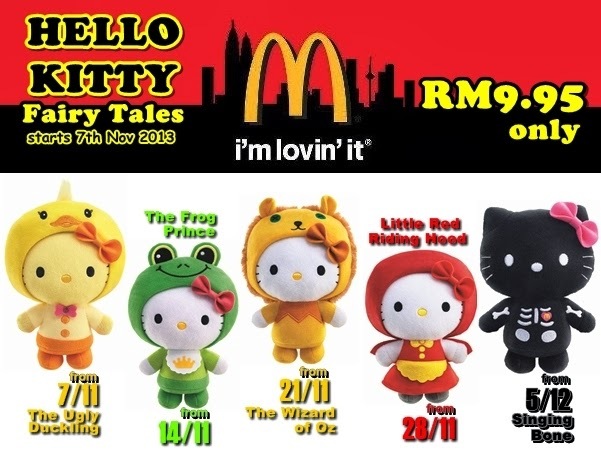 McDonald’s Hello Kitty Fairy Tales Collection arriving soon to Malaysia. I bet you want to collect all these cute 5 limited edition Hello Kitty plush toys that designed exclusive for McDonald’s starting from 7th Nov 2013. McDonald’s Hello Kitty Fairy Tales Collection from five popular fairy tales around the world. Each design, which comes in a special collector’s storybook-themed box, will be launched every week beginning from 7th November 2013, Thursday. How do I get them all? These exclusive official Sanrio Hello Kitty plushies are only available for a limited time and in limited quantities and are exclusive to McDonald’s. Each of the McDonald’s Hello Kitty Fairy Tale plushies are available for only RM9.95 with the purchase of any McValue Meal. Purchasing Mechanics: The McDonald’s Hello Kitty Fairy Tales Series promotion is available at Front Counter, Drive-Thru, McDelivery 1300-13-1300 and Web Ordering Service. • Toy designs will be available starting Thursday, 7 Nov 2013 from 12.00 midnight onwards for 24-hour McDonald’s restaurants. • For the rest of our restaurants, the toys will be available at the start of its business hour on Thursday, 7 Nov 2013. • The Hello Kitty Fairy Tales Series plush toys are only available while stocks last. I want all the 5 Hello Kitty !! !